Stéphanie and Jérémie Gicquel – aka the Runners to the Pole – live in Paris, France. They have graduated from HEC Paris, Sorbonne Masters of Law, Paris School of Economics and work as lawyers. They are also long distance runners and polar explorers. They explored Spitsbergen, Greenland, and ran a marathon at the Geographic North Pole. 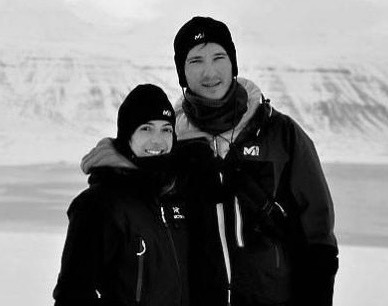 Stéphanie and Jérémie also skied across Antarctica through the South Pole over 2,045 km in 74 days, between November 2014 and the end of January 2015. This expedition is notably the longest ski expedition (without kiting) for a woman in Antarctica. They directed a movie and wrote a book about this journey, Across Antarctica. Photos taken during their expeditions are regularly displayed in public areas to show the beauty of the polar regions. They also give lectures to contribute to a better knowledge of Antarctica (geography, history, exploration, climate, etc). They notably gave lectures at Le Bourget and at the French Ministry of Ecology during COP21. These lectures and the photos exhibitions are labeled COP21 by the French Ministry of Ecology.